How long have you been dancing? I have been dancing a little over 1 1/2 years. How did you get into ballroom? I love to dance but I wanted to do something different. I started out by going to dances that teach West Coast Swing. After doing that for a little while, someone mentioned PaperMoon. 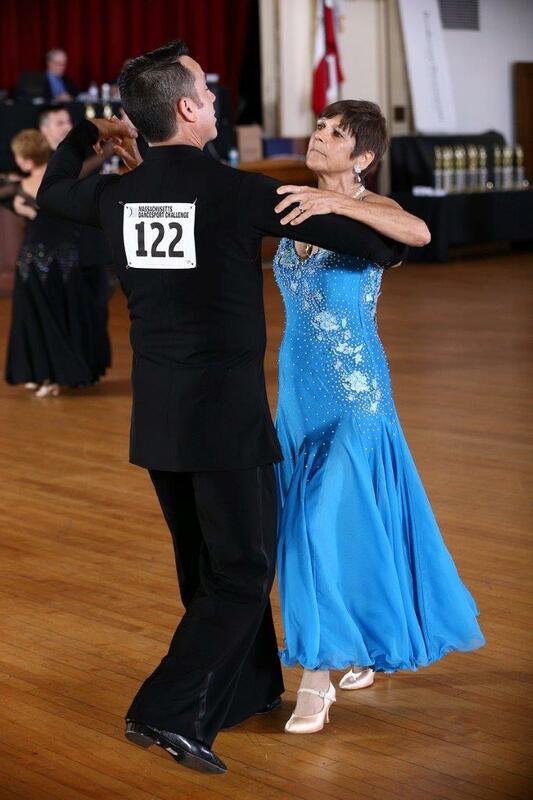 At the time I wasn’t sure if I wanted to get into ballroom dancing but I eventually decided to try it and I love it. What is your favorite dance memory? So far it has been dancing in the formations and the competitions with Ray. What dance goal would you like to conquer next? I want to work on dancing better at the dance competitions. What are your other hobbies? I enjoy the summer, going to the beach and the lake with my kids and grandkids. Tell us something you think most people don’t know about you. I have 5 grandchildren 3-21 years old that I spend a lot of time with. My oldest granddaughter is living with me. I love sci fi and fantasy movies like the Hobbit, Star Wars, and Star Trek and go to the movies to see them whenever a new one comes out.